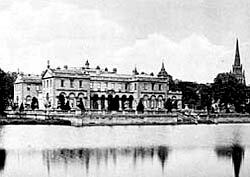 Clumber House, c.1900. The house was demolished in 1938. The National Trust own the extensive park. Leaving Worksop, the first of the great houses we reach as we drive from the town is the ducal residence at Clumber, with its memories of famous owners and its rich treasures of art. Entering by the lodge gates we pass through the midst of a glorious woodland, with its wealth of graceful trees and its thick undergrowth of fern, bracken, and heather making a carpet of varied hues. On the grassy lawn, which fringes the park, rabbits and squirrels are sporting in the sun, while the woods echo with the merry notes of feathered songsters. Presently the front of the mansion may be seen towering amid the trees, and then we get a delightful view of Clumber from the bridge, which spans the lake. Looking across the placid water, into which the trees gracefully dip their branches, and on the surface of which the wild fowl are swimming without thought of danger, we see in the distance the magnificent terraces for which Clumber is famous, the stately mansion, and, towering over all, with its finger pointing heavenwards, the bright red spire of the beautiful church which has just been erected. It is an enchanting vista, and one that it is difficult by any word-painting to bring before the imagination with sufficient vividness and truth. But who made it what it is? How came the house with its beautiful surroundings to spring up on the border of quiet forest-glades, which about a century ago consisted of little more than a black heath full of rabbits, having a narrow river running through it, with a small boggy close or two? For answer we must turn to history. In a previous article on Haughton, and on the ruins that remain there, we have shown that the original seat of the ancestors of the Dukes of Newcastle was at Haughton Park. Here stood a large mansion with attractive grounds, which Sir William Holles, a great merchant and Lord Mayor of London, purchased of the Stanhope family in the reign of Henry VIII. His son lived at Haughton in great splendour and hospitality. It is recorded of him that he began his Christmas at All Hallowtide and continued it until Candlemas, during which time any man was permitted to stay three days without being asked whence he came or what he was. He kept a company of actors of his own to perform plays and masques at festival times, and never travelled without thirty or forty men in livery at his heels. His son John, the second Earl, was born at Haughton, and the mansion continued the residence of the family until the time of the fourth Earl, John, who was born in 1663. This worthy married Margaret, third daughter of Henry Cavendish, second Duke of Newcastle, and was himself raised to the dignity which his father-in-law had held. By his family connections and marriage he became one of the richest men in the kingdom, and was created Duke of Newcastle in 1694, three years after his father-in-laws death. It is said that his own estate and the Cavendish together amounted to £40,000 per annum  an enormous sum in those days. Haughton, upon the acquisition of these estates, was suffered to fall into ruin, and the Duke took up his abode at Welbeck Abbey. Afterwards, says a writer quoted by Throsby, when the Holles and the Cavendish estate came to separate again, and the latter went through the Harleys to the Bentincks, a mansion was wanted for the former, and Clumber Park, which might be a lodge before, was by degrees extended to its present size and importance. Haughton, where Denzill Holles and many other eminent men were born, was allowed to decay, and eventually removed, all now remaining being the ruins of the chapel. Clumber having thus been selected as the site of a family seat, preparations for a house on a scale of becoming magnificence were made. About 1772 a mansion was erected, extensive plantations laid out, lake and pleasure grounds formed, and so palatial an abode created, that Throsby, who visited the place 25 years after its construction, quaintly describes it as calculated to paradise the mind. The estate had been carried from the Holles family to the Pelhams, and through the Pelhams to their relatives, the Clintons. And a very famous and historic family it is that gave to Clumber its princely abode, and that has exercised a powerful and beneficent influence on the fortunes of this country. Without entering into the dry-as-dust details of an ordinary pedigree, we may mention two or three of a long line of Clintons, who took a prominent and worthy part in affairs of State. Geoffrey de Clinton, with whom Dugdale commences his history of the family, was Lord Chamberlain and Treasurer to Henry I., and afterwards Justice of England. Foss, in his Judges, says he was a witness to the Kings charter to Westminster Abbey. He built the castle of Kenilworth, and gave all the lands he had there, except those attached to the castle and park, to endow the priory of Augustinian monks which he had founded. His possessions extended through no less than fourteen counties. William de Clinton was Lord High Admiral in 1333, and created Earl of Huntingdon in 1337. John, second Lord Clinton, and John, the third Lord, distinguished themselves in the wars of Edward III., and William, the fourth Lord, in the conflicts of succeeding reigns. John, the sixth Lord, fought under Henry VI. in France, and was a prisoner more than six years; while Edward, the ninth Lord, was a distinguished commander at sea, and Lord High Admiral of England in 1550. He was advanced to the title of Earl of Lincoln, and died in 1585. Henry, the second Earl, was one of the Commissioners on the trial of Mary Queen of Scots, and Theophilus, the fourth Earl, was a staunch supporter of the royal cause during the Civil War. Sir William Henry Clinton, son of the sixth Earl, was Commander-in-Chief of the land forces in America, and his brother Henry was Lieutenant-General. The seventh Earl filled successively the important offices of Paymaster-General, Constable of the Tower, and Cofferer to the royal household; while his second son, who became the ninth Earl, also held several of the highest offices at Court. This nobleman married Catherine, eldest daughter and heir of Sir Henry Pelham, and inherited, in 1768, the Dukedom of Newcastle, on the demise of her ladyships uncle, Thomas Pelham-Holles, who had been created Duke in 1756, with special remainder to the Earl of Lincoln. As Clumber was built about 1770, it would be this nobleman, we presume, who would have the chief hand in its construction, and would make it the ancestral home of the family in those parts. Of the eminent Dukes who have lived at the forest mansion mention must be specially made of Henry Pelham, fifth Duke, who died deeply lamented in 1864 after a busy life devoted to the public service. His Grace filled the onerous offices of Chief Secretary for Ireland, Secretary of State for the Colonies, and Secretary of State for War, holding the last-named appointment during a portion of that most anxious and trying periodthe Crimean War. Miss Martineau, writing his memoir in 1864, says, Few Ministers could be more missed and mourned by good citizens of all parties and ways of thinking. Those who were nearest to him were subject to frequent surprises from his simplicity, his unconcealable, conscientious, and abiding sense of fellowship with all sincere people, whoever they may be. As a nobleman of aristocratic England he was in this way a great blessing and a singularly useful example. His Grace died at Clumber with awful suddenness, October 18, 1864. At twenty-five minutes past six oclock on that day he was conversing freely with his solicitor, Mr. Quvry, that gentleman having been to the church festival at Shireoaks, and the Duke had been expressing his gratification at the great success of the festival, when he suddenly threw up his arms, gave a shriek, and died in about four minutes. His Graces physician and two or three other gentlemen were present at the time. The body was interred in the family mausoleum at Markham Clinton. 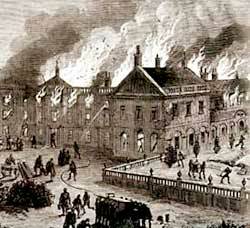 Clumber House on fire in March 1879. From the south front, facing the lake, the terraces stretch to the edge of the water, and make a most pleasing and effective picture. On the eastern side of the mansion the noble Duke to whom Clumber now belongs has made a splendid addition by the erection of a new church. It is a handsome structure, and gives dignity and beauty to the surroundings of a palatial abode.